Our reconditioning products will benefit all outdoor surfaces. Click on the links below to learn about the specific surface and how it's treated. PLEASE TAKE A FEW MINUTES TO READ THIS THOROUGHLY. IT WILL HELP YOU PROTECT YOUR INVESTMENT FOR YEARS!! Pressure washing removes the gray, dull, dirty look which hide the natural beauty of all wood surfaces. We use 100% biodegradable cleaning solutions. This is safe for our environment, children and pets. We use hand sanders to smooth out any rough areas. Next, we tarp the ground around and underneath the deck, and the house, to prevent over spray of our solution. Then we apply (Behr's) special transparent, penetrating oil based sealer with UV protection. Behr's special solutions keep wood beautiful and more natural looking longer and assures future maintenance will be worry free. One coat, sprayed then back brushed will penetrate deep into wood. Once dry, Behr's sealing solution will dramatically enhance the look of wood. 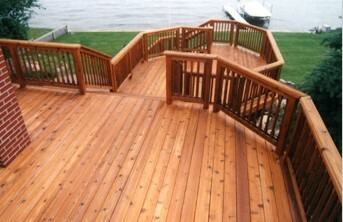 The majority of deck owners are happy with the appearance and durability of Behr Cedar Tone Natural. Behr also offers an available Honey Tone, Rustic, Clear and Coastal Gray to best accent you homes exterior appearance. 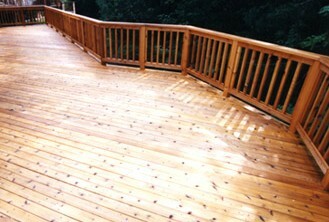 We wash and seal every outside wood surface imaginable. Gazebos, trellises, hot tub exteriors, docks, house cedar siding, seawalls, fences. Over a period of time, pavers receive stains and build-up due to traffic, spills, and weather. 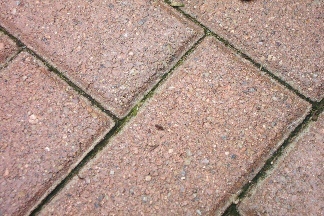 Moss, algae and weeds develop between the paver joints and "efflorescence" cause a white milky look to appear on the surface of the pavers. Unsealed pavers and cement give off concrete dust that is easily tracked indoors. Iron patio furniture and accessories will cause rust marks to appear which get worse and more imbedded over time. The use of a snow plow in the winter will leave long scratches on the surface of the pavers. The sun's intense UV rays fade the natural color of the brick. Finally, unsealed bricks move over time, uneven high and low areas begin to form, or retaining edge fails causing pavers to shift position. Our solutions are specially formulated to clean pavers, restoring them to their original beauty. 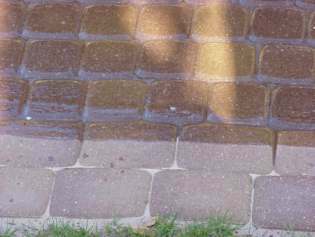 We utilize state of the art cleaning equipment and chemicals to remove all dirt, stains, moss, algae and weeds from the brick. Next, once fully dry, we apply a jointing sand to fill in the joints. This will give back the solid foundation, just like when your pavers were constructed. And finally, we apply a clear, non-yellowing acrylic sealer which intensifies the color. Our solutions offer protection against stains from nature, de-icing salts, grease, and oils. NAS-T Solutions Inc (Nationally Acclaimed Slip-prevention and Sealing Technology) supplies all our concrete sealers and cleaners. It was developed exclusively for our colored stamped concrete, paver and hardscape surfaces. Their solutions are a result of extensive testing, research and development. No other company offers such high quality sealers and cleaners. Not only will Vulcan UV seal and block out harmful UV rays, but we can also apply a non-slip additive to any surface to help prevent slip and falls, a #1 hazard around the home. NAS-T Solutions will give brick the wet look, deepening the color and appearance. It creates a surface that's beautiful, durable and easy to clean using just a hose and spray nozzle. NAS-T Solutions recommends sealing every 2 years, with harsh winters, to refresh the look of the sealer. Experts agree that the durability of exterior masonry depends mostly on the resistance to water penetration. Most surfaces are designed to be durable; over time, rain and other moistures slowly erode and crack mortar joints due to expansion and contraction cycles with different seasons. We have a counter measure for this. NAS-T Solutions has created sealer to penetrate and bond up to 1/4" below the surface. After this solution has been applied it becomes part of the stone, and provides lasting protection. No matter how old, dirty or neglected the surface is, our cleaning equipment and specialized chemicals will restore the like new appearance. 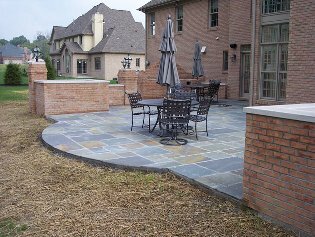 We specialize in cleaning and sealing all hardscape such as colored stamped concrete, natural stone and all masonry. 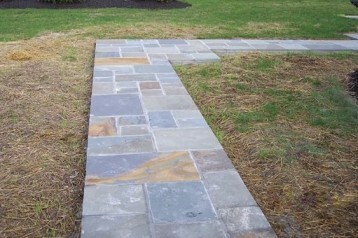 Once cleaned, we highly recommend sealing all hardscape surfaces with NAS-T Solutions Vulcan UV sealer. This product was developed exclusively by NAS-T Solutions and is the result of years of research and development. No other company offers this high quality sealer. NAS-T Solutions Vulcan UV preserves newly cleaned hardscape by forming a chemical bond below the surface that repels water and stains from the top while allowing moisture within the stone to escape through the sealer. NAS-T Solutions Vulcan UV sealer is designed not to change the natural look of the treated surface once fully dry. It repels stains making them easier to remove because they can no longer absorb into the pores of the treated surface. This occurs primarily during the freeze/thaw cycles of fall, winter and early spring. The best way to create a showroom new appearance on garage floor concrete is application of a high quality 2 part epoxy paint. We exclusively use NAS-T Solutions Sure Bond™. We prepare the surface properly by application of a concrete cleaner/degreaser to lift embedded stains and etch the pores of the concrete so the solution will adhere properly. Pressure washing removes the grease and dirt, lifting it to the surface and rinsing it away. Once the garage is dry we apply the NAS-T Solutions Sure Bond™ epoxy paint mixing in fine ground plexi-glass and kevlar for slip resistance. No other company offers such high quality non-slip additives. They specialize in non-slip surfaces. Most companies add a silica sand to their epoxy. In time, the silica breaks away from the epoxy, leaving loose sand on top of the floor, making it more slippery and dangerous than before. With new technology, there is no need to use silica. The solution dries overnight and hardens to create a beautiful, durable surface resistant to staining, peeling and industrial chemicals. We offer a variety of color options so you may choose the most appealing look for your new garage floor.